Gaston Engineering & Surveying, P.C. has an in-house soils and materials testing laboratory that is capable of handling various ASTM, AASHTO, and Department standard tests on aggregate, asphalt, concrete soils, etc. The laboratory is capable of conducting soils proctors, sieve analysis, Atteberg tests, moisture content, and other testing necessary for the successful completion of any project. The soils laboratory also includes an in-house concrete cure room that is maintained at a proper temperature and humidity for storing up to 200 concrete cylinders. 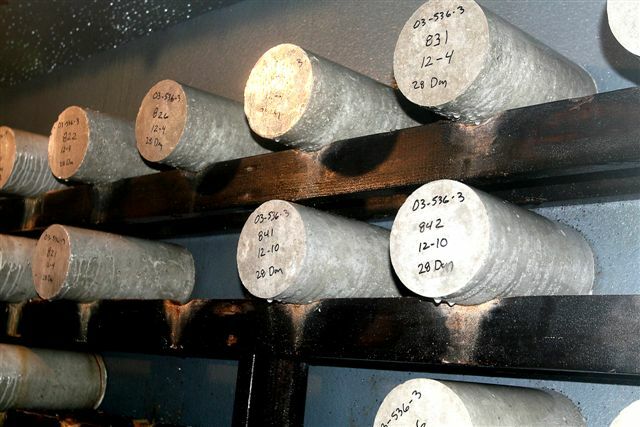 Cast concrete cylinders can be properly stored in the cure room until the required tests are needed to determine concrete strength. Gaston Engineering & Surveying owns a calibrated and certified compression tester that is used for testing and breaking of concrete cylinders. This equipment is valuable for testing of any concrete that is poured on-site to ensure the proper concrete strength is achieved. We have staff that are ACI concrete certified for operation of this equipment. We are also able to perform grout and mortar testing that might be required for any project.